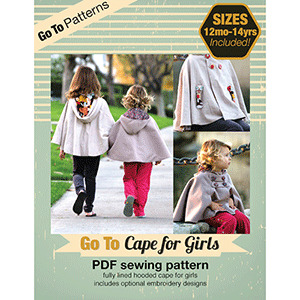 This adorable Go To Cape sewing pattern for girls is perfect for all ages. Sew one in a lightweight linen for warmer weather or use fleece or wool for the colder days. This sewing pattern for beginners has professionally drafted pattern pieces, helpful instructions with photos and beautiful details. This is the children's version of the Go To Cape for Women. 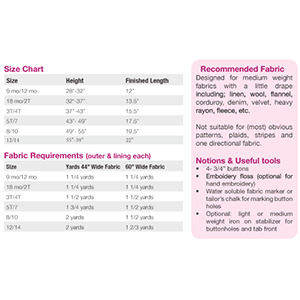 Recommended fabrics are medium weight fabrics with a little drape including; denim, linen, wool, flannel, corduroy, velvet, heavy rayon, fleece, etc.